Allpress Espresso isn’t just a major roaster in the speciality coffee scene, with roasteries in New Zealand (where it all started in 1986) Australia, Japan and the UK. It also runs its own roastery/cafés, starting (in the UK) with the original roastery/coffee shop on Redchurch Street which opened in September 2010. Redchurch Street’s still going, but only as an espresso bar, the roastery moving out to its new site in Dalston in May 2015. Naturally, there had to be a café attached, which is the subject of today’s Coffee Spot, while the roastery was subject of its own Meet the Roaster feature back in January. The new roastery/café is huge, with plenty of room for expansion. The main café, which includes a full kitchen, is downstairs on the left, with an even larger upstairs area at the front that opens at the weekend for brunch. There’s also some lovely outside seating options in a large garden in front of the roastery, which is set back from the road. If you’ve come for coffee, there are different options on espresso, pour-over and bulk-brew, while for food, there are full breakfast and lunch menus, as well as mixed plates, sandwiches and cakes. The Dalston roastery/café was a revelation to me. Although I’ve been to, say, Caravan and Steampunk, which are large, with small roasting areas attached, given the size of Allpress as a roaster, I was expecting a large roastery and small café, somewhere like Rave Coffee or the Tandem Cafe & Roastery. How wrong I was! The building itself is gorgeous, a two-storey, brick-built warehouse (I think), the wide front punctuated with multiple, large, multi-paned windows. It’s also huge, with plenty of space for a large roastery (on the right) and an equally large café (on the left). There’s even a large garden with a wall at the front, making for the perfect outdoor setting, with a couple of bench-seats and two long tables, one either side of the door. If you don’t fancy sitting outside, or are daft enough to visit in January, when it’s too cold, follow the path to the central door. There’s an open staircase to your left, with the roastery behind a glass screen to the right. A corridor leads between the two, depositing you at the counter, about halfway down on the left, which curves around and runs towards the back of the building. There’s some seating here, a row of two-person tables up against the glass partition on the right, or, on the left, a long bar running along the extended counter, behind which is the open kitchen. However, most of the seating’s behind you on the other side of the stairs, where two rows of tables run down to the windows. This is a gorgeous area, flooded with sunlight from the south-facing windows. The stairs also start at the counter, heading up towards the front of Allpress, before doubling back on to deposit you facing the back. Although only open at weekends, it’s worth a visit since, if anything, it’s even nicer up here. There’s a separate counter directly ahead of you, with offices and training rooms beyond (and off to the left). Once again, the seating’s behind you, a row of tables and a row of back-to-back booths to the right, overlooking the roastery. There’s also a row of tables running along the very front by the windows. Finally, to the left of the stairs there’s a row of four tables next to a wood-burning stove and, beyond that, a large nook contains a wonderful communal table. It’s even more flooded with light up here, since, as well as the windows at the front, the roof at the back is largely glass. When it comes to coffee, Allpress’s entire range is available, although, as explained in the Meet the Roaster feature, this isn’t very extensive, Allpress preferring to do a few things and do them extremely well. There’s the ubiquitous Redchurch and Three Bells blends (plus decaf) on espresso, plus two single-origins (a Kenyan and a Guatemalan during my visit) on filter. 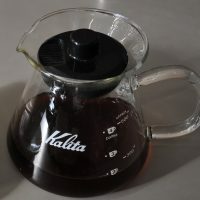 One (the Kenyan) is available on batch-brew, the other can be had as a Kalita Wave pour-over using the Marco Beverage Systems’ SP9 automated brewing system. This entry was posted in Breakfast, Cafe/Roaster, Cafes, Cake, Coffee Gardens, East London, Lunch, Retailers, Roastery, Sandwiches and tagged Allpress, include by Brian Williams. Bookmark the permalink. Those ecoffee cups are fab. We sell lots of them (check out the new William Morris range!) but really hope you will review the new Pokito cups. Such a great product for when you are travelling . Still early days as regards being stocked at speciality cafes (although selling fast at our Edge café at the roastery., so I’m confident that they will catch on soon…) Let me know if you want one!